Bardakjian was summarily disbarred. He had earlier pled guilty to committing grand theft (Cal. Penal Code Section 487(a)) -- a felony involving moral turpitude. The California Supreme Court issued the disbarment order after receiving evidence that the conviction was final. Drage was summarily disbarred. He had earlier been placed on interim suspension pending final disposition of his convictions of conspiring to impair and impede the IRS (18 U.S.C. Section 371) -- a felony involving moral turpitude, as well as three counts of willfully failing to file tax returns (26 U.S.C. Section 7203) -- misdemeanors that may or may not involve moral turpitude. The Office of the Chief Trial Counsel of the State Bar had initially transmitted the convictions in 2015, but the federal court set aside the felony count. That conviction was reinstated on appeal and became final after the amended judgment was not appealed within the statutory period. Goseco was disbarred from the practice of law after he stipulated to committing a single act of professional discipline: failing to file a timely declaration of compliance as required in an earlier disciplinary order (Cal. Rules of Ct., Rule 9.20). He initially filed a declaration within the proscribed time limit, but it was deemed noncompliant as it contained conflicting responses. The compliant declaration he eventually filed was 93 days after the date it was due. In aggravation, Goseco had two prior records of discipline and showed indifference toward rectifying his misconduct by repeatedly failing to comply with conditions imposed in his disciplinary probation order. In mitigation, he entered into a pretrial stipulation, saving the State Bar significant resources and time. Kleier was disbarred from practicing law after an original disciplinary proceeding found he had failed to comply with the contractual terms of the State Bar Court's Alternative Discipline Program (ADP) to which he had earlier agreed. In the underlying matter, Kleier had stipulated to committing 54 counts of misconduct in eight separate matters. His wrongdoing included: failing to deposit client funds in a trust account; three counts of failing to inform the State Bar of judicial sanctions imposed against him; four counts of failing to promptly return clients' files; five counts of failing to promptly return unearned advanced fees; six counts each of failing to obey court orders, failing to promptly pay clients funds to which they were entitled, and failing to respond to reasonable client inquiries; seven counts of improperly withdrawing from employment; and eight counts each of failing to perform legal services with competence and failing to cooperate in the State Bar's investigations of the misconduct alleged. Kleier had initially participated in both the Lawyer Assistance Program and ADP, but was terminated from the ADP for noncompliance. Because of that, the State Bar Court recommended imposing the higher level of discipline: disbarment. Kun was disbarred after seeking summary review of a judge's ruling finding him culpable of several counts of professional misconduct and recommending disbarment. He was found culpable of: failing to obey a court order, failing to report judicial sanctions imposed against him, misleading a judge and committing an act involving moral turpitude in that process. In the underlying matter, Kun obtained a default against the defendant in a case alleging breach of contract and fraud. In the application, however, he sought an order that an individual should appear; he knew that person was not the judgment debtor. He also filed an application seeking an order of sale of the individual's property, again knowing he was not a party to the lawsuit. The trial judge, State Bar Court judge, and panel on appeal all found he intentionally sought to mislead the court. Kun and his client were then sanctioned $3,000, but he did not inform the State Bar as required. In aggravation, Kun had three prior records of discipline and committed multiple acts of misconduct that significantly harmed the non-party who was inappropriately implicated -- requiring him to hire an attorney for help. In addition, he demonstrated indifference toward rectifying the consequences of his misconduct, causing the hearing judge to note and the panel to underscore that he "remains defiant and has no insight regarding his unethical behavior." The panel did not find any of the arguments Kun raised on appeal to be persuasive. In recommending disbarment, it stated: "Over the years, Kun has engaged in a plethora of ethical misconduct, including, but not limited to, multiple acts of very serious misconduct that include disclosing client secrets, misappropriation of client funds, four counts of moral turpitude, two counts of seeking to mislead a judge, and failing to obey a court order." Levine was disbarred by default after he failed to participate in his disciplinary proceeding, in person or through counsel, despite receiving adequate notice and opportunity. He did not seek to have the default entered against him set aside or vacated. He was found culpable of the single count of professional misconduct charged: failing to cooperate with the State Bar in its investigation of the wrongdoing alleged. Levine had two prior records of discipline. Luti was disbarred after appealing a hearing judge's opinion finding him culpable of four counts of professional misconduct and recommending disbarment. The panel on appeal dismissed two of the counts charged, but found Luti culpable of misappropriating funds entrusted to him -- misconduct involving moral turpitude and of commingling personal and client funds in his trust account. In the underlying matter, Luti had agreed to be the escrow agent for a transaction in which an adult entertainment company agreed to deposit $15,000 in escrow to be paid to an actress after she completed the terms agreed to in a contract. He received the escrow check and deposited it into his client trust account. Days later, he began making withdrawals from the account to pay personal obligations; within a month, the escrow funds were substantially depleted. About a year later, the client's lawyer learned of Luti's misuse of the funds and recommended appointing a new escrow agent; she also paid the company $7,830 as "de facto escrow." Five years later, the company and the actress attempted to terminate the escrow agreement; the company demanded that Luti disburse to it the balance of escrow amount: $7,170 -- the total escrow amount minus the "de facto" amount paid. He responded that he had been released as agent five years earlier -- though he had not withdrawn formally. After the company filed a complaint with the State Bar, investigators discovered eight additional instances in which Luti had used client trust account funds to pay personal expenses. On appeal, Luti argues the misappropriation and commingling charges were time-barred as not brought within five years of the date the violation occurred. The panel on appeal found, however, that the limitations period did not apply to the commingling charge -- reasoning that it was based not on the complainant's allegations, but discovered during the State Bar's investigation of the misconduct alleged. It also rejected Luti's contention that the tolling provision (Cal. Rules of Court, rule 5.21) should not apply to his case because he did not act as an attorney for either the company or the actress. It concluded that the provision "applies to fiduciary relationships just as it does to attorney-client relationships" and that the rule of limitations is tolled "so long as the fiduciary relationship exists." In aggravation, Luti was allotted significant weight for his demonstrated lack of insight into the wrongfulness of his actions, as well as moderate weight for committing multiple acts of misconduct. He was also assigned limited aggravation for a prior discipline order, which was based on actions committed before the present misconduct. In mitigation, he received moderate credit for the evidence offered by seven character witnesses, as they did not represent both the legal and general communities; limited weight for entering into a pretrial stipulation of easily proven facts; and limited weight for the remorse he expressed at trial -- though he did not take any prompt steps to atone for the wrong. Miller was disbarred by default. Although he personally appeared for a status conference and filed a response to the Notice of Disciplinary Charges of 13 counts of professional misconduct related to three client matters, he failed to appear at trial. After filing a motion to set aside the default entered against him and again appearing at a status conference in the case, he again failed to appear for trial -- signaling his intention by email one hour prior to trial. He did not move to have the second default order set aside or vacated. Miller was found culpable of all counts charged, including three counts each of failing to maintain client funds in trust, breaching his fiduciary duties, failing to cooperate in the State Bar disciplinary investigations, and misappropriating client funds -- misconduct involving moral turpitude. He was also found culpable of one count of issuing checks from his client trust fund when he should have known there were insufficient funds to cover them -- wrongdoing that also involves moral turpitude. When the disbarment order was recommended, there were additional disciplinary investigations pending against Miller. O'Connell was disbarred from the practice of law after both he and the Office of Chief Trial Counsel (OCTC) of the State Bar appealed the hearing judge's finding of culpability for 16 counts of misconduct and order recommending two years of actual suspension. On appeal, the OCTC argued disbarment was more appropriate; O'Connell maintained he was not culpable of any of the misconduct charged. The panel on appeal found O'Connell culpable of 13 counts of professional misconduct related to four client matters. The wrongdoing included: failing to perform legal services with competence, failing to promptly release a client's file after being terminated, and improperly dividing client fees; two counts of failing to return unearned advanced fees; and four counts each of and accepting fees from nonclients without first obtaining the clients' written consents and failing to render the clients with accountings of work performed. The fact patterns in three of the client cases were similar: O'Connell agreed to represent clients who were incarcerated after criminal convictions. He was paid "non-refundable fees" by family members -- who eventually became frustrated by the lack of legal progress in their cases. He did not seek written approval from any of the clients to have the fees paid by their family members, nor did he provide the requisite written disclosure and consent about splitting fees with another attorney in one of the cases. In two of the cases, he was found culpable of failing to refund the fees paid after he was requested to do so. In the fourth matter, O'Connell represented a client who had been found not guilty by reason of insanity and committed to a state hospital. Again, he accepted "non-refundable fees" from a family member without obtaining the client's consent. The client was eventually placed on outpatient status based on recommendations from other professionals involved, but both the hearing judge and panel found O'Connell did not provide any legal services of value that contributed to that release. In aggravation, O'Connell committed multiple acts of wrongdoing, failed to make restitution in two of the matters, and had been disciplined by the State Bar for professional misconduct twice before. In mitigation, he was allotted moderate weight for character testimony offered by two judges and his own daughter. Peters was disbarred following a contested disciplinary proceeding in which he was found culpable of 13 of the 15 counts of professional misconduct with which he was charged. Specifically, his wrongdoing included: failing to communicate significant case developments to a client, failing to refund unearned advanced fees, failing to account for a client's funds, collecting an illegal fee, failing to comply with conditions of an earlier disciplinary probation order, and practicing law while suspended -- misconduct involving moral turpitude; two counts each of failing to obey court orders and making misrepresentations -- which also involves moral turpitude; and three counts of practicing law while not entitled to do so. In the underlying matters, Peters appeared in court and represented several clients while actually suspended under the terms of an earlier disciplinary order, failing to inform the clients, the courts, and co-counsel of his suspended status as required (Cal. Rules of Ct., Rule 9.20). He committed the misconduct involving moral turpitude by stating in his 9.20 declarations that he had made the proper notifications and that he had no papers or property to which the clients were entitled when he knew those statements were false. In the probation violation matter, he was found culpable of failing to comply with conditions requiring him to make four restitution payments. In aggravation, Peters committed multiple acts of misconduct causing significant harm to his clients and to the administration of justice, and had a prior record of discipline. 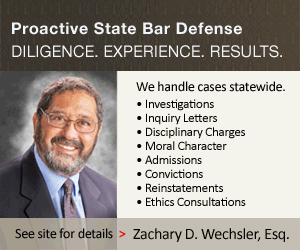 In mitigation, he cooperated with the State Bar by entering into an extensive stipulation. He was also allotted limited mitigation weight for performing community service work and for suffering extreme emotional difficulties -- both of which were not supported by evidence outside of his own testimony. Tackowiak was disbarred after a one-day trial in which he was found culpable of eight of the nine counts of professional misconduct with which he was charged. The wrongdoing occurred in two separate client matters. Because he failed to respond to a request for discovery and to file and serve a pretrial statement, his witnesses and documents were excluded at trial -- though Tackowiak was permitted to present his own testimony there. He also failed to file a closing brief. He was found culpable of failing to perform legal services with competence, failing to maintain client funds in trust, improperly withdrawing from employment, failing to promptly repay a client entrusted funds, and misappropriating the client's funds -- misconduct involving moral turpitude. In addition, he was deemed culpable of two counts each of failing to provide accurate accountings of the clients' funds and failing to cooperate in the State Bar's investigations of the wrongdoing alleged. In one matter, Tackowiak was hired to represent a client in a dissolution case, depositing more than $189,000 of the client's funds in his trust account. The money was garnered from the client's liquidated retirement funds and proceeds from selling his home. Approximately 15 months later, the client terminated Tackowiak's services. Soon after that, Tackowiak presented a final accounting that misstated "deposits" received by more than $9,000, as well as a $3,000 error in the amount noted as "returned" to the client. The accounting also noted that he would pay the client a $3,000 discount by a specific date. When he failed to do so, the client sued in small claims court and prevailed, though Tackowiak did not pay the judgment. While the matter was being disputed, the balance in his client trust account dipped to impermissibly low levels. In the second client matter, Tackowiak was hired by two brothers to transfer inherited real property to them from a trust held in their mother's name. They paid a total of $2,250 in legal fees, which included $500 for a "CPA attorney." The brothers terminated Tackowiak's services after two years had passed with no progress in their case. They requested a full refund, which Tackowiak did not pay, nor did he provide them with an accounting of their funds. In aggravation, Tackowiak had been disciplined by the State Bar for professional misconduct twice before. In addition, he failed to participate meaningfully in the instant proceedings, significantly harmed the clients involved, and failed to make restitution to them. Turner was disbarred by default after he failed to participate in the disciplinary proceeding in which he was charged with six counts of professional discipline involving a single client matter. He did not respond to the Notice of Disciplinary Charges with which he was served or the motion for default, which was accompanied by a supporting declaration of reasonable diligence used to provide him with notice. He was found culpable of all counts charged. The wrongdoing included: failing to perform legal services with competence, failing to maintain client funds in trust, failing to repay client funds after being requested to do so, failing to provide the client with an accounting, commingling personal and client funds in a trust account, and misappropriating client funds -- misconduct involving moral turpitude. Turner had a prior record of discipline, and when the disbarment order was issued, there was another disciplinary matter pending against him. Bell was suspended from practicing law for one year and placed on probation for two years after she stipulated to pleading guilty to several offenses related to two separate DUI incidents, as well as being culpable of violating a court order in another matter. In the first conviction proceeding, Bell was arrested after losing control of her car and colliding into a curb, ending up in a parking lot. Her two children, ages 6 and 10, were in the vehicle. Arresting officers determined her blood alcohol content was .38 percent. She pled guilty to two felony counts of child endangerment (Cal. Penal Code Section 273a(a)) and three misdemeanor counts: driving under the influence of alcohol (Cal. Veh. Code Section 23152(a)), driving under the influence with a blood alcohol concentration of .08 percent or higher (Cal. Veh. Code Section 23152(b)), and driving without a license (Cal. Veh. Code Section 12500(a); she also admitted to an enhancement for driving with a blood alcohol content of .15 percent or more (Cal. Veh. Code Section 23578). Less than two years later, Bell was stopped by highway patrol officers who had observed her driving slowly and weaving in and out of lanes. She was unable to complete the field sobriety tests and then got back in her car and attempted to drive away. Bell was arrested after attempting to bite an officer who tried to remove the keys from her ignition. She eventually pled guilty to the misdemeanors of resisting arrest (Cal. Penal Code Section 69), driving under the influence with a blood alcohol concentration of .08 percent or higher (Cal. Veh. Code Section 23152(b)), and an enhancement for driving with a blood alcohol content of .15 percent or more (Cal. Veh. Code Section 23578). The State Bar Court found the facts and circumstances surrounding the two incidents did not involve moral turpitude, but did involve other misconduct warranting professional discipline. In another matter, Bell was culpable of failing to timely file a compliance declaration with the State Bar Court (Cal. Rules of Ct., Rule 9.20) as required in an earlier disciplinary order; she filed a compliant declaration nearly five months after it was due. In aggravation, Bell committed multiple acts of wrongdoing. In mitigation, she entered into a pretrial stipulation, was given slight mitigation credit for having practiced law discipline-free for six years, and has taken objective steps to demonstrate her remorse by focusing on her recovery through seeking treatment and attending AA meetings. In a separate order that also took effect on January 2, 2019, Bell was suspended from practice pending proof of passing the Multistate Professional Responsibility Examination as required in the terms of a previous disciplinary order. Derosa was suspended from the practice of law for 30 days and placed on probation for one year after she stipulated to commingling personal and client funds in her client trust account. During a one-year period, Derosa made 32 withdrawals, by writing checks or making electronic transactions, using funds in her client trust account to pay personal expenses. Also during that time, she made 18 electronic transfers of personal funds into her client trust account. In aggravation, Derosa committed multiple acts of wrongdoing. In mitigation, she entered into a prefiling stipulation; had practiced law for 10 years without a record of discipline; and did not harm a client, court, or the administration of justice with her misconduct. In addition, she provided 11 character reference letters from individuals taken from both the legal and general communities, and offered evidence of serving on various legal service committees. Greco was suspended in the interim following her convictions of the felonies of burglary (Nev. Rev. Stat. Section 205.060), forgery (Nev. Rev. Stat. Sections 205.090. 205.095, and 205.110), and offering a false instrument for filing (Nev. Rev. Stat. Section 239.330), as well as the misdemeanor of destroying evidence (Nev. Rev. Stat. Section 199.220). The California State Bar Court judge ordered the Office of Chief Trial Counsel of the State Bar to provide analysis and legal support backing its contention that the offenses all involve moral turpitude as a matter of law under analogous laws in this states. Lago was suspended for six months and placed on probation for two years. He had filed a stipulation acknowledging that he committed seven acts of professional misconduct related to two separate client matters. He was culpable of: practicing law in a jurisdiction where he was not entitled to practice, failing to practice law with competence, failing to maintain client funds in trust, failing to render an appropriate accounting of client funds. He was also culpable of misconduct involving moral turpitude: one count of misappropriating client funds and two counts of making false statement on documents filed with a court. In one client matter, Lago filed a form and submitted two declarations to a court claiming he was a member in good standing of the federal bar when he was not. He then filed bankruptcy petitions for 43 debtors. In the other matter, Lago was retained to file a Chapter 7 bankruptcy for a client, who paid him $2,885, which included fees for the attorney, credit report, and court filing. Lago then experienced health difficulties and misplaced the client's file for several months. Also during that time, the balance in his client trust account dipped to an impermissibly low level. For more than two years, he failed to file the bankruptcy petition for the client -- who ultimately requested a full refund. In aggravation, Lago committed multiple acts of misconduct that significantly harmed a client. In mitigation, he entered into a pretrial stipulation, had practiced law discipline-free for approximately 38 years, and submitted evidence from 12 individuals taken from a wide range of the legal and general communities -- all of whom attested to his good character. Lamarre was suspended from practicing law in the interim pending final disposition of his convictions of driving under the influence of alcohol with three prior convictions within 10 years and driving with a blood alcohol concentration of .08 percent or above with three prior convictions within 10 years (both violations of Cal. Veh. Code. Sections 23152(b) and 23550). The offenses are felonies that may or may not involve moral turpitude, depending on the facts and circumstances. Ramirez was suspended for 90 days and placed on probation for two years after a consolidated conviction proceeding resulting from misdemeanor convictions for driving under the influence of alcohol with a prior DUI within 10 years (Cal. Veh. Code. Section 23152(a)), driving under the influence of alcohol with a blood alcohol concentration of .08 percent or more with a prior DUI within 10 years (Cal. Veh. Code. Section 23152(b)), and driving with a suspended license (Cal. Veh. Code. Section 14601.5(a)). The parties stipulated, and the State Bar Court judge found, that the facts and circumstances surrounding the violations did not involve moral turpitude, but did involve other misconduct warranting professional discipline. After that proceeding commenced, Ramirez was accepted into the State Bar Court's Alternative Discipline Program (ADP), which he completed successfully. In aggravation, Ramirez committed multiple acts of misconduct and had been disciplined for professional misconduct twice before. In mitigation, he entered into a stipulation as to both facts and conclusions of law and submitted evidence of his good character from a wide range of references in the legal and general communities who were aware of the full extent of his misconduct. He was also given mitigation credit for successfully completing the ADP. Because he completed the ADP, the State bar Court judge recommended the lower level of discipline set forth in the Confidential Statement executed earlier. Roberts was suspended from the practice of law for six months and placed on probation for two years after he stipulated to committing four acts of professional misconduct related to two client matters. He was culpable of two counts each of failing to release his clients' papers and property after being requested to do so and of failing to cooperated in the State Bar's investigations of the wrongdoing alleged. In both cases, Roberts represented criminal defendants -- both of whom ultimately sought other representation. He did not return the clients' files when asked and ignored. He also ignored a total of eight letters from State Bar investigators seeking information after receiving complaints of his misconduct. In aggravation, Roberts committed multiple acts of wrongdoing and had two prior records of discipline. In mitigation, he entered into a pretrial stipulation in the instant case. Roberts was suspended in the interim pending final disposition of his conviction of conspiracy to commit wire fraud (18 U.S.C. Section 371). The offense is a felony involving moral turpitude. Seuthe was suspended from the practice of law pending proof of passing the Multistate Professional Responsibility Exam -- one of the terms imposed in an earlier disciplinary order. Shirer was suspended for one year and placed on probation for three years following an original disciplinary proceeding in which she was found culpable of failing to comply with two conditions imposed in an earlier disciplinary order. Specifically, she failed to provide the State Bar with proof of paying restitution and failed to schedule an initial meeting with her assigned probation deputy. In aggravation, Shirer had three prior records of discipline. In mitigation, she cooperated with the State Bar by entering into a partial stipulation of facts, had honest and understandable confusion about the date the restitution payment was due because of an erroneous statement form the Office of Probation, submitted evidence of performing community service, showed good faith by complying with her probation conditions -- albeit belatedly, and testified credibly that she suffered from health and emotional problems during the time of the misconduct. Sprouls was suspended from practicing law for six months and placed on probation for three years following his appeal of that discipline, which had also been recommended by the hearing judge below. He was found culpable of one count of failing to perform legal services with competence and two counts of moral turpitude related to misrepresentations in a motion filed with the immigration court and in a statement to State Bar investigators. Sprouls was hired to obtain a nonimmigrant status visa for a woman and derivative status visas for her four young children. However, the application originally filed did not include mandatory additional forms, and two of the children's applications lacked the required signatures. The U.S. Citizenship and Immigration Services (USCIS) noted these deficiencies and issued a Request for Evidence, allotting nearly three months for the required documentation to be submitted. Sprouls' longtime paralegal replied by supplying the requisite signature pages, but failed to include the requisite additional forms. The USCIS ultimately denied all five applications. Sprouls met with the clients after the 30-day deadline to re-open the case had passed, and refiled the visa and derivative beneficiary petitions -- although two of the children had aged out and become ineligible for the relief sought; he again failed to include the additional forms required. In a motion to the Board of Immigration Appeals, Sprouls stated his office never received a Request for Evidence -- a statement made questionable due to the fact that a response, albeit an inadequate one, had actually been filed. The clients eventually retained new counsel who filed a State Bar complaint against Sprouls. In a letter to State Bar investigators, Sprouls wrote: "In my 23 years of practicing law, I have never misled or misinformed the Court or Government counsel and there has never been such an allegation made against me." This squarely contradicted the fact that the Ninth Circuit had issued a memorandum disposition years earlier in another case in which it found Sprouls had filed a motion that "included false statements of fact." That case became part of an earlier disciplinary action in which the State Bar Court found him culpable of 51 acts of professional misconduct related to dozens of immigration cases -- though the State Bar amended its own opinion from stating that the brief he filed contained "the same false statements of fact" to "failed to correct the errors and false statements contained in his previous motions." In aggravation, Sprouls had a previous record of discipline -- that given "substantial weight," as the underlying misconduct was similar to some of the wrongdoing in the instant case. Aggravating weight was also allotted for committing multiple acts of misconduct that caused significant harm to highly vulnerable clients -- described as "poor, undocumented immigrants who were unsophisticated in immigration laws and procedures." In mitigation, he cooperated with the State Bar by entering into a factual stipulation, was given modest creditt for pro bono work, and moderate mitigating weight for 11 character witnesses -- all of whom were affiliated with the legal community. The panel on appeal rejected Sprouls' contention that the public would be harmed by his actual suspension since it "would be deprived of a zealous, intrepid and highly effective immigration litigator." Weisberg was suspended from the practice of law for 30 days and placed on probation for one year after he stipulated to holding himself out as entitled to practice and actually practicing law when he was not an active member of the State Bar. Weisberg was earlier placed on administrative suspension and enrolled on non-eligible status following his failure to report compliance with Minimum Continuing Legal Education requirements. During that time, however, he made five different court appearances for various clients and filed several documents in which he identified himself as an attorney. In aggravation, Weisberg committed multiple acts of wrongdoing and had been disciplined by the State Bar for professional misconduct once before. In mitigation, he entered into a prefiling stipulation and submitted nine character letters from individuals who were aware of the full extent of his misconduct. Heisey was placed on probation for two years after he stipulated to pleading no contest to two alcohol-related driving offenses. He was culpable of two counts of driving while having a blood alcohol concentration of .08 percent or more (Cal. Veh. Code. Section 23152(b)); in the second incident, there was also an admitted enhancement for a DUI conviction within 10 years (Cal. Veh. Code. Section 23540) and driving with a blood alcohol content of .15 percent or more pleading no contest to driving while having a blood alcohol concentration of .08 percent or more (Cal. Veh. Code. Section 23578). All the offenses are misdemeanors, and the State Bar Court judge determined that the facts and circumstances surrounding the violations did not involve moral turpitude, but did involve other misconduct warranting professional discipline. In one incident, police officers were called to investigate a collision involving two vehicles. There, a witness stated she had followed behind the care Heisey was driving -- observing it swerve and drift before rear-ending the other vehicle. When questioned, he showed signs of inebriation and failed the field sobriety tests he was asked to perform. In the other matter, a police officer stopped Heisey for driving a vehicle with expired registration. He got out of his car and approached the patrol vehicle, admitting to the officer he had been drinking. A breath test showed he had a blood alcohol content of .13 percent. He refused the offer to be released to a sober friend or family member, saying he "deserved to serve a day in jail for his actions." In aggravation, Heisey committed multiple acts of wrongdoing, and compromised the safety of other individuals and their property. In mitigation, he entered into a pretrial stipulation, had practiced law for 18 years without a record of discipline and submitted four letters from individuals who were fully aware of his misconduct and attested to his good character and dedication to maintaining sobriety. Liang was placed on probation for one year after he stipulated to pleading no contest to driving with a blood alcohol concentration of .08 percent or more (Cal. Veh. Code. Section 23152(b)) and resisting and obstructing a peace officer attempting to discharge assigned duties (Cal. Penal Code Section 148(a)(1)). In the underlying matter, Liang was driving his vehicle while intoxicated, with his nine-year-old son as a passenger in the car when he struck and damaged a chain link fence on the roadside. Though a large section of the fence became affixed to the front of Liang's car, he continued to drive two miles to his home. While approaching his home, the fence fragment struck and damaged his neighbor's parked vehicle. When police officers came to Liang's home to investigate the two incidents, he admitted to consuming alcohol and to being the driver causing the damages. He then became uncooperative, however -- shouting profanities and refusing instructions; the officers placed him in handcuffs and a body restraint. The State Bar Court judge determined that the facts and circumstances surrounding the violation did not involve moral turpitude, but did involve other misconduct warranting professional discipline. In mitigation, Liang entered into a full stipulation early in the disciplinary proceedings, had practiced law without a record of discipline for more than 18 years, and submitted evidence of volunteer community service. In aggravation, he caused a substantial amount of property damage. In addition, the State Bar Court judge noted Liang showed a disregard for the law "despite his over 10 years of experience as a deputy trial counsel for the State Bar of California handling attorney misconduct cases." Butner was publicly reproved after being found culpable of practicing law while not authorized to do so and of moral turpitude in holding herself out as entitled to practice and actually practicing while not authorized. The California Supreme Court suspended Butner's license to practice law after she failed to pay her State Bar membership dues. About seven months later, two of her friends approached her, asking for legal assistance with a contractual payment dispute. She informed them she had allowed her license to lapse for nonpayment of fees, but ultimately agreed to represent them pro bono -- drafting and mailing a demand letter on her legal letterhead, and referring to herself as "attorney at law" and her two friends as "clients." In mitigation, Butner stipulated to some relevant facts establishing her culpability, and presented evidence from 19 individuals representing a range in the legal and general communities -- all of whom attested to her good character and community service work. O'Brien was publicly reproved. He had earlier entered a guilty plea to one misdemeanor count of driving under the influence of alcohol (Cal. Veh. Code Section 23152(a)), with admitted enhancements for having a blood alcohol concentration of .15 percent or more (Cal Veh. Code Section 23578) and committing a second DUI offense within 10 years (Cal Veh. Code Section 23540). In the underlying matter, U.S. border patrol agents summoned highway patrol officers to a hotel parking lot to perform a driver evaluation on O'Brien. They had earlier observed him weaving in and out of lanes while driving on a freeway. The officers arrested him after observing his signs of intoxication and poor performance on a field sobriety test. Eight years earlier, he had also pled guilty to a misdemeanor DUI offense. In mitigation, O'Brien had no prior record of professional discipline in 19 years of legal practice and entered into a pretrial stipulation acknowledging his misconduct. Punta was publicly reproved after stipulating to committing four acts of professional misconduct related to a single client matter. He was culpable of improperly withdrawing from employment, failing to promptly refund unearned advanced fees, failing to respond to a client's reasonable case status inquiries, and failing to cooperate in the State Bar's investigation of the misconduct alleged. In the underlying matter, Punta was hired to represent a client in traffic court, accepting $81.76 as advanced fees. He then took no action in the case, effectively withdrawing from representation. After the client hired new counsel, Punta failed to respond to 10 phone calls from that lawyer requesting information about the case. He returned the unearned fees to the client after the State Bar initiated disciplinary proceedings against him. In aggravation, Punta committed multiple acts of misconduct. In mitigation, he entered into a pretrial stipulation and had practiced law for more than 14 years without a record of discipline. Reyes was publicly reproved after he stipulated to pleading nolo contendere to one count of driving under the influence of alcohol with a blood alcohol concentration of .08 percent or more (Cal. Veh. Code. Section 23152(b)), a misdemeanor. The State Bar Court judge found that the facts and circumstances surrounding the violation did not involve moral turpitude, but did involve misconduct warranting professional discipline. In the underlying matter, Reyes was stopped at a sobriety checkpoint and at first denied that he had been drinking any alcohol, then stated he had earlier consumer two beers. He showed signs of intoxication during field sobriety tests and was arrested. In mitigation, Reyes entered into a pretrial stipulation, saving the State Bar time and resources.